s part of our revamp plan for 2019, we felt it was time for a few changes in the VIDA magazine. This change coincides with the Spring season, a time generally associated with growth. 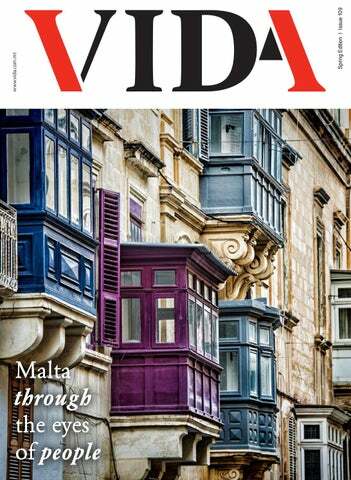 The new concept kept in mind one key question; “What should VIDA stand for?” Indeed, VIDA seeks to define a Maltese lifestyle through the eyes of local personalities, entrepreneurs, professionals, academics and also common people we come across whilst watching TV, shopping, walking into Valletta or whilst driving to work during the busy traffic hours. 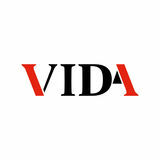 In order to reach our objective, VIDA looks at lifestyle at a micro level and gradually looks into the other circles which lead us to the macro level. We look at the individual in the context of key themes including fashion and interior design. Lifestyle is later observed through the eyes of people hidden in various corners of local towns and villages. VIDA also looks at lifestyle from a national point of view including photography, culture, entrepreneurship, environment and infrastructure. Last but not least, the local lifestyle is also seen in the context of the country’s surroundings thus touching on topics such as health, travel and food. When all themes come together, the reader is provided with a holistic picture of what contemporary Maltese lifestyle stands for. No part of this publication may be reproduced, or transmitted in any form without prior consent from FKL Ltd.
any responsibility nor be held accountable for any factual errors printed. 59 Childhood Obesity. A Global Epidemic. A President’s Legacy Interview with H.E. Marie-Louise Coleiro Preca, President of Malta These include the challenges of climate change, social inclusion, the celebration of diversity, and a commitment to the principles of universal human rights. My Presidency has also focused on making practical efforts, to translate the values of social justice into a reality in the lives of our Maltese communities. I believe that whenever people promote solidarity, by working together to achieve the common good, then the whole of our society is enriched. For this reason, I opened the Presidential Palaces to be palaces of, and for, the people. These safe, respectful, and inclusive spaces have created a context for important dialogues, about the concerns and aspirations of the people of Malta and Gozo. 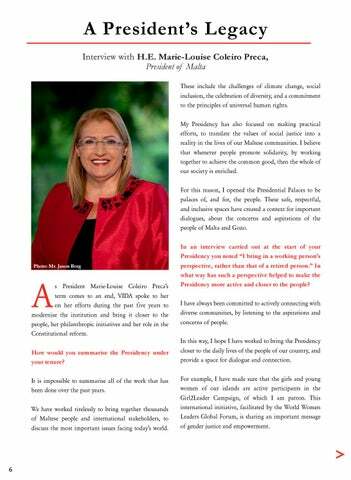 s President Marie-Louise Coleiro Preca’s term comes to an end, VIDA spoke to her on her efforts during the past five years to modernise the institution and bring it closer to the people, her philanthropic initiatives and her role in the Constitutional reform. How would you summarise the Presidency under your tenure? It is impossible to summarise all of the work that has been done over the past years. We have worked tirelessly to bring together thousands of Maltese people and international stakeholders, to discuss the most important issues facing today’s world. 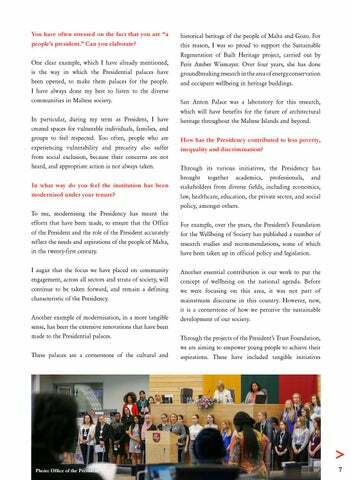 In an interview carried out at the start of your Presidency you noted “I bring in a working person’s perspective, rather than that of a retired person.” In what way has such a perspective helped to make the Presidency more active and closer to the people? I have always been committed to actively connecting with diverse communities, by listening to the aspirations and concerns of people. In this way, I hope I have worked to bring the Presidency closer to the daily lives of the people of our country, and provide a space for dialogue and connection. For example, I have made sure that the girls and young women of our islands are active participants in the Girl2Leader Campaign, of which I am patron. This international initiative, facilitated by the World Women Leaders Global Forum, is sharing an important message of gender justice and empowerment. because it provides an inspiring example of how our children and young people can participate, as active contributors to society. The President’s Trust Foundation has undertaken numerous projects that specifically target issues of social concern. For example, it has developed an employment initiative to empower young people living in precarity, and another initiative that is supporting children from disadvantaged backgrounds and socially deprived areas. I have also focused on the promotion of gender equality and women’s rights in numerous ways. One example is the support I have given to establish the European Observatory on Femicide at the University of Malta. This observatory is providing essential data about the deadly violence that is being endured by women and girls, all over Europe, and what we can do to stop this terrible scourge. In what way have you offered a stronger voice to NGOs? I have focused on creating synergies among the public sector, private sector, and civil society, both as Minister and as President. I believe that such collaborations are essential, because they ensure that our democracy will continue to be healthy. We must keep encouraging such partnerships and collaborations, in order to take our democratic aspirations to the next level of effectiveness. In this way, we will ensure that sustainable peace and inclusive prosperity are always a priority on the national agenda. When I set up the CORE Platform, it was to bring businesses together with civil society groups, and to promote the corporate social responsibility endeavours of our private sector stakeholders. You spearhead the steering committee on Constitutional reform. How will such reforms contribute to a more relevant constitution? Furthermore, as well as defending and upholding the Constitution, the President has the opportunity to take an active role as a defender of universal human rights and fundamental freedoms. During these uncertain times in the history of our world, we need more champions of these rights and freedoms, which safeguard the dignity of all of us. What legacy will you leave? As I have stated in my various speeches on Republic Day, the reform of our constitution is an opportunity for the people of Malta and Gozo to have an active role in the relationship that is established, by the Constitution, between the State and its citizens. Reform is part of what makes the Constitution a living document, capable of reflecting the presentday aspirations and concerns of Maltese people. I will ensure that this process is inclusive and transparent, and engages with communities throughout our Maltese society. In a recent interview you noted, â&#x20AC;&#x153;The presidency, like any other constitutional institution, also needs to be reviewed.â&#x20AC;? In what way? I believe that the role of the President has changed since it was first introduced. There is so much for the President of the Republic to offer, in terms of being an impartial and objective voice in our society. I hope that my legacy will be reflected in the work that I have done. Opening the Presidential Palaces to make them safe spaces for the people, and to encourage opportunities for dialogue and connection, is one part of this legacy, which I would love to leave. Ensuring that wellbeing becomes part of our national discourse and policy is another, as well as promoting the active participation and inclusion of all our citizens, including child participation. I believe that our people should be in control of their own lives and able to fulfil their aspirations, by feeling engaged as active citizens of our democracy. Above all, I augur that my legacy will be a celebration of the principles of social justice. We must keep reaching out across social and cultural borders, to build bridges which unite the diversity of Maltese society. he local fashion industry has another feather in its cap thanks to the amazing talent of Krystle Penza. Her handcrafted jewellery under the brand Mvintage is bold, fresh and compelling, with a focus on timeless beauty. Irrespective of the jewellery’s theme, each of Krystle’s creations emphasize her desire to “make something interesting and innovative”. Since the launch of her very first pieces, Krystle’s work has literally taken the market by storm, with interest also from the international market. We sat down with Krystle to discuss the ethos behind the Mvintage brand, her source of inspiration for her collections and her secret to juggle a successful business and a personal life. How did it all start? Mvintage started as a pipe dream. I’ve always been surrounded by strong women pushing me to achieve my dreams and reach my potential. My daughter’s birth spurred me on to set an example for her; by applying will power and determination, I wanted to show her that anyone’s dreams could transpire. As a result, Mvintage was started on the basis of honouring the women in my life, which in turn transformed into a community dedicated to celebrating and empowering women from all walks of life. Why jewellery? Because the power of jewellery is underestimated. It is transformative; with the ability to change your disposition and alter your confidence. Regardless of whether you’re wearing a basic t-shirt or an elegant outfit, throwing on a few key pieces has the power to elevate your spirit, as well as your look. Jewellery is a reflection of who you are; the pieces you choose and the way you wear them, gives a little insight into your story. Mvintage jewellery is more than just metal and stone; I use my designs as a means of telling a story, and in doing so, aspire to give women the ability to express themselves and exude confidence. Our pieces are infused with symbolism so that each woman can create her own little narrative with her jewellery. stand by established brands, and be a competitor within its own right. You are a wife, a mum and an entrepreneur. How do you create a perfect balance between them? It’s difficult to maintain a balance, and I don’t always manage to do so. My personal life and work are intertwined and often overlap; my husband works alongside me and my daughter is a very active presence at the office. In this sense our core value of Family becomes quite literal, with my own family being such a significant part of Mvintage. I appreciate the fact that my family is by my side through my journey with the brand; my daughter has grown up seeing my dreams come true every day, and I am truly grateful to be able to illustrate the effects of a determined spirit to her. That being said everyone requires time to unwind. I make it a point to strike a balance when possible by taking time away from Mvintage and spending it with my family; whether its at home, out and about or on a holiday, their time is precious and I make sure to direct the attention required. What’s next on your agenda? I don’t want to reveal too much but there are exciting things on the horizon. Our first step is to set up the official Mvintage HQ this year; an overdue dream in the making. Consequently, we shall be opening more stores locally and franchising overseas. After this we’re looking to set up operations internationally and keep improving our online efficiency, with new markets in mind. “HELLO” CORNERS. WE’VE MISSED YOU. Our Pre-Spring Rush Event ﬂags off the start of the new riding season. Imagine riding away with the hottest deals on our Sportster™ models. VISIT OUR DEALERSHIP AND FEEL THE POWER OF THE HARLEY-DAVIDSON® V-TWIN. CORNERS WILL THANK YOU. * AT TIMES OF PURCHASE, while stocks last. TERMS & CONDITIONS APPLY. ©2019 H-D OR ITS AFFILIATES. H-D, HARLEY, HARLEY-DAVIDSON AND THE BAR & SHIELD LOGO ARE AMONG THE TRADEMARKS OF H-D U.S.A., LLC. more about her. Her work is intriguing, vibrant and with unique touches here and there, which are often inspired from her local and Mediterranean surroundings. Above all, her scarves, bow ties, eye masks filled with dried lavender seeds, pocket squares, and her exclusive cushion collection are what she defines as the product of a contemporary visual, with quirky characteristics. At her outlet in Rabat, Sef shared with us her passion for design, her recent collections and her plans for the future. ‘SEFFARRUGIA’, to keep introducing beautiful items in my mini shop, and hopefully produce a clothing collection some time soon. Functionality in Design Interview with Désirée Azzopardi, Interior Designer and media. I became fascinated with interior design and knew that this was the subject I wanted to graduate in. How would you describe your style? When designing solely for myself and my own satisfaction, my style is flamboyant, decorative, colourful and vibrant. It is far from subtle, subdued or grey. However, when designing for clients, I aim to give them something that doesn’t scream ‘Désirée’ but something that intrinsically reflects them, because they will live with it not me. I find it unethical to totally impose my style onto something which my clients are going to live in daily or wear. So first and foremost I ensure that the design is something that they can identify with. Secondly, it will be something that I both approve of and love. I will never create a design or an interior that I don’t agree with, or approve of. I do my best to find a happy medium between what the client specifies, and something that I believe looks aesthetically pleasing and special. Tell us about the creative world of Désirée. It has no boundaries, be it interiors, fashion, set design, furniture, art, street art, etc. In what way do you consider travelling as a source of inspiration? When I travel, I free my mind. I break away from the numbing routine of the familiarity of the usual streets, traffic, people, politics, vibes and work. When I travel, I feel more alive and free. It’s like my mind gets high on creativity as if it is connecting with a higher source of imagination. It is extremely liberating and highly addictive. As a result, I carry a little notebook wherever I go and write down whatever comes to mind. I also read a lot whilst in airports, planes, and trains. I find it helps me significantly and feeds my brain further. What do you look to achieve in every project to make it outstanding? Client satisfaction. The satisfaction of achieving something that makes people wonder, stop and smile. Be it the client or any passer-by, I find that to be truly rewarding. In what way is your work uniquely asymmetrical? I find symmetry to be tiring both on the eyes and the brain. Nature is very relaxing and not symmetrical, hence why I try to follow nature in that respect. How is Malta changing from an architectural and interior design point of view? From an architectural point of view, it is changing in many ways, however, not all of these are as desirable as I would like them to be. From an interior perspective, it is changing in a great way I’d say. With social media platforms, people are more aware of how to invest in their space and how necessary interior designers are. It is no longer a subject solely associated with the luxury industry, but rather it has become a necessity for all budgets considering the amount of time one spends in a given space. Where do you feel that fashion and interior design are complimentary? Fashion design is a form of expression using clothes and accessories. Interior design, I believe is no different, except that it uses different media; furniture, walls and floors. What’s next for Désirée? I am quite a free-spirit and will go wherever the wind takes me. However, 2019 is proving to be very exciting with some very unique projects coming up in both the Art field as well as in the Design world. I am looking forward to seeing what else 2019 has in store. xotic birds, beautiful flowers, delicate plants and Maltese seashells are the perfect source of inspiration for Saz Mifsud’s impressive collections. Painter and designer, Mifsud has over the past years earned a reputation as one of the best products in the local fashion industry. Her brand was born from the idea that a painting can become a piece of clothing. She strives to merge the worlds of art and fashion by transferring her paintings and photography to fabrics, which are then hand-sewn into beautiful women’s and men’s accessories. Saz Mifsud shared with VIDA what encouraged her to develop her very own brand, her sources of inspiration and her plans for the future. What attracted you to design? I was drawn to the fashion world at a young age. A visit to a costume exhibition in France stands out in my memory. When you look at French historic costumes you find beautiful fabrics, impeccable sewing and the most intricate hand-crafted beading, stitching and embroidery. I was so attracted to the thought and hardwork behind each piece of fabric - the process a piece of cloth goes through before it even becomes a garment. This was my first taste of design, and since then I’ve been hooked. How did your studies at the University for the Creative Arts in the UK develop your interest to start your own brand? My studies taught me how to create digital textiles my degree was specifically in Fashion Print Design. It gave me the knowledge necessary for creating digitally printed designs on fabrics, and then turning those fabrics into garments. I believe that the most beautiful way of showing an entire print is on a scarf, as you get to see the whole design just as you would when looking at a painting in a frame. This mindset pushed me to start my scarf brand back in 2013.
food. What are the origins of Roger’s Bakery? My parents lived in Rabat, the place where my father worked as a baker, yet in 1968, they relocated to Żejtun. Whilst moving south, my father was on the look-out for a bakery. He was lucky to come across an outlet in Żejtun, which quickly earned a reputation among locals as one of the best producers of traditional Maltese pastizzi. My interest in the production of pastizzi came quite natural, since from a very young age I used to help my father until the time was right for me to take over. What pride does this profession offer? It gives me a strong sense of satisfaction to see people appreciate the taste of a good cheesecake. Unfortunately, locals often take for granted the work, the story, and the taste in every cheesecake. It is part of our culinary culture, and we should give the product more respect. Moreover, I am pleased to have recently developed cheesecakes which may be in a way, coined as ‘healthy’. In what way has the recipe of cheesecakes changed over the years? The method remains the same, yet the ingredients have changed significantly. The dough is no longer made with fat, but rather with a healthier option, vegetable butter. This industry is struggling like other similar sectors. The young generation prefers to opt for professions which guarantee a higher income and less working hours. This industry requires many sacrifices, long hours and a lower return. Unfortunately there are many people who are afraid to eat cheesecakes because of the high volume of calories. Did you ever consider the possibility of introducing new flavours? Do you feel cheesecakes should be considered as junk food? I kept loyal to the traditional flavours, the demand for ricotta and pea cakes is still very strong. Introducing new flavours is highly risky and time-consuming. We only change flavour on Good Friday, when we use anchovies instead of corned beef. I do not feel cheesecakes should be considered as junk food. We generally focus on the negative side of the product and often miss out on its benefits, including the fact they do not contain any additives to extend their shelf life, and that they are oven cooked. Moreover, there are misconceptions on the quantity of calories they contain. The figures often mentioned are not correct, exaggerated, and misleading. How many cheesecakes do you produce on a weekly basis? I would say, thousands. Only big volumes guarantee a stable income. Do you feel this profession is in danger of extinction? Is there any interest from your daughter to take over the business? I am currently teaching my daughter the tricks of the trade. She is showing keen interest to follow in my footsteps and actively supports me in the business. Hopefully, she will take over the business in the coming years. Deputy General Manager Business Development Executive Interested candidates can send the CV to : info@coldwellbanker.mt Strictest conďŹ dentiality will be respected. WHATâ&#x20AC;&#x2122;S BETTER THAN 2 PIZZAS? t is amazing how food can take people to different corners of the planet to grow their talent. I was aware of the impressive number of local talent in the food industry working in different corners of the planet, yet would have never imagined to learn about the story of a Maltese chef working in the Swedish city of Strömstad. I came across Chef Vidal through some work he recently posted on a social media platform which encouraged me to contact him, and get to know his story better. His work is amazing and highlights his sense of creativity and eye for detail. During our conversation, Chef Vidal shared his journey in the world of food and what attracted him to the home of ABBA. What attracted you to the world of food? My connection with food started at a young age. I always enjoyed watching my dad making cakes for special family occasions in Canada. When we moved to Malta my dad started working at my uncle’s confectionary in Luqa, and after school and on weekends I always used to go and help him with pastries, cakes and making ravioli. That’s when I realised that I wanted to work in the food industry. At first my thoughts were to work solely with pastry, but after starting at the Institute of Tourism Studies I realised that I wanted to be a chef and work with all types of dishes along with pastry. In what way did the Institute of Tourism Studies help you develop your culinary skills? The Institute of Tourism Studies was a really good way to achieve my goals within the industry. If I was going to be a chef I knew that I wanted to get the proper knowledge of the basics of cooking. A lot is learned in the restaurants and hotels that one works in, but I still believe that chef school is important to understand all the theory behind cooking, and to do the practise how it is meant to be done. The school also gave me great opportunities to compete both in Malta and abroad. What encouraged you to choose Sweden as your next destination? top of the list of teams winning medals. When reading about certain restaurants I thought that the standards must be pretty high. How would you describe your style of cooking? My cooking tends to be Mediterranean with hints of Swedish cuisine. When I started to work in Sweden I was still choosing to cook Mediterranean food whenever I got the choice to decide what was to be cooked. But after a couple of years working here, I started to use more and more Swedish ingredients. I like to use different textures in my dishes as I think that’s a very important part in cooking. What are the major challenges of leaving your country to pursue a career abroad? When I left Malta to work in Sweden I was a bit nervous. The first challenge which comes to mind is the language. I think it’s very important if you are planning to move to a different country is to try to understand and speak the native language. It makes life much easier. Another challenge was the cuisine. It’s important to keep your influences which you were brought up with, but to also keep an open mind and be able to adapt to different types of cuisines and techniques which might not be so common in kitchens that you started out in. Why is it important for local prospective chefs to look beyond local shores? I don’t really think it’s important, as I believe that by staying in Malta you’re able to have a good career in the catering business. I would see it more as a way to see other things, and learn different stuff. It’s a good learning block to have, that you have seen and worked in different places. If anything I think the question of ‘why abroad instead of Malta’, would come down to working conditions. In what way has the current young local talent in Malta and abroad helped to develop further the Maltese culinary industry? Young chefs are the future for the culinary industry in Malta. It’s a bit of a hard question to answer from not living there, but from my recent visit I do think that Maltese pastry shops are keeping tradition, whilst at the same time looking at other things done abroad. For example, I visited Busy Bee in Mrieħel, it still keeps the traditional pastries that we are used to, but also has started to introduce new things seen more in pastry shops abroad. This is down to chefs wanting to develop something different, but also keeping the traditional. You should never forget where you come from. How do your Maltese roots fit into your work? I try to keep my Maltese roots in the flavours I use. I do like to use Scandinavian flavours and tend to use them also, but I fall back a lot on flavours from my childhood that I was brought up on. I think Maltese cuisine is underrated sometimes, the usual cuisines gets a lot of recognition from around the world, but Malta being a small country is usually looked past. I truly believe that we are just as good, and we should be proud of our cuisine. What should we expect from David Vidal? For me, the next thing this year will be doing courses around the world, which will probably continue onto next year. Mostly all around Europe, but also places like Indonesia and U.S.A. In between that, I’d like to maybe start writing a book and who knows, maybe one day open something of my own. this is twofold. A greater sense of space, monumentality and historical context is achieved. Having no blind spots creates a sense of safety and reduces the risk of crime. Kiosks and transport services surround the periphery of the square but leave a hardstone clad space open for the general public. In what way does the current Triton Square give true justice to the entrance of our glorious capital city? Triton Square was designed with three objectives in mind. Firstly its aesthetic approach and materials used had to complement both the surrounding historical context, and Renzo Piano’s Building Workshop city gate project. Secondly, a lot of thought was put into the experience of walking from Floriana through the piazza and into Valletta. Today you can approach Valletta linearly, through the main axis intersecting Kristu Re Monument, the main stair case and Triton Fountain, or angularly through the tree-lined avenues flanking the square. Historically the general public would have to take a similar angular passage through bastion walls to get to the main bridge. Archaeological pits show remnants of these demolished fortifications which have informed margin patterns and slope geometry of the square. GHRC also wanted the space to be an attraction on its own. It was designed to allow for large public events, carnival float access, as well as impromptu social gatherings. Consciously avoiding defensive architecture designs, three types of seating have been installed, successfully attracting different groups of people to rest and socialize for free. The project is proof that through new ideas, hard work and cooperation, a balance between historical context, societal wellbeing and functionality can be achieved. The Triton Fountain is certainly the central feature in City Gate Square. What did its restoration involve? The restoration and upgrading of the fountain was handled by a specialized team within the Ministry of Transport, Infrastructure and Capital Projects. GHRC co-ordinated with this team to achieve a successful project. The fountain was extensively damaged due to mishaps, past repairs and errors during the initial casting process. Apapâ&#x20AC;&#x2122;s tritons comprised of cast bronze segments which were then welded together. Each triton was disassembled, into two pieces at an original welding joint, before being shipped to a Florentine foundry to be restored. A major aspect of the Triton Fountain upgrade that is overlooked by the general public is the installation of a new high-tech water system. Replacing the previous public toilets, a large plant room consisting of ten water pumps, water filters a control systems was built. The system automates and monitors the operation of the water treatment plant and of the waster features in conjunction with the architectural lighting. until work was completed. The transition between the old and new design was critical as the bus service, taxis, horse carriages, â&#x20AC;&#x2DC;Hop-On Hop-Off â&#x20AC;&#x2122; and services to third parties had to still operate. This coordination could only be done with constant communication with all involved entities. Underlying archaeology also proved a challenge. GHRC studied historical plans, photos, dug exploratory pits but still there was no certainty what could be uncovered during excavation. Archaeologist supervised all excavations and recoded all findings. Sometimes these findings clashed with our proposal causing urgent redesigns of services and sometimes layout of the proposed square. GHRC managed to incorporate these findings while maintaining the clean slope geometry and wheelchair accessibility of the square. What were the major challenges you came across during the works on Triton Square? The project also included the planting of indigenous trees around the square. What other greenery does the renovated Triton Square feature? pleased to see the general public is choosing to sit and use Biskuttin garden nowadays What other major projects is GHRC currently working on? GHRC has just completed and is soon opening the Valetta landfront ditch project, which will be known as Gnien Laparelli. It has been entrusted with the ERDF funded regeneration project of Valletta Marsamxett Area, where it is aiding in the renovation of Historic buildings social housing, public open spaces and seafront area. GHRC’s work also reaches outside Valletta with projects such as the regeneration of Kalkara waterfront, Floriana Mall garden and works on Senglea’s Entrance gate and belvedere. SSANGYONG MUSSO grand LWB REVEALED visit our showroom for more details! he details captured in a plate, the perfectly timed snapshot of busy mundane life and the messages behind a still life image have earned Brian Grech a reputation as one of Malta’s best talents in the photographic industry. His bold and intriguing photographic vision is the result of a mixture of classic and contemporary styles, inspired by his surroundings and his frequent travels. His photographs are elegant, sophisticated and with a touch of timeless quality, highlighted by the perfection of imperfection and the beauty in every element that surrounds us. Brian Grech shared with us his love for photography, his photographic view of Malta, and his plans for the future. I believe that exposing people to new things, or bringing their attention to something they wouldn’t look at twice helps to educate, to open people’s minds, to see things differently and possibly remove biases; sometimes triggering off a more philosophical understanding. If art can manage to touch the soul, it has achieved its aim. What attracted you to photography? There was something in photography which captured my interest from a very young age. I was always fascinated by the fact that photography had the power to capture or create a moment and pass that emotion on to the viewer. In what way does visual imagery have more impact? In what way is Malta an amazing place for a photographic shoot? We are living in an era where the visual element narrates all, or most of the story. From a commercial point of view, it is the time where companies are investing most in their visual media, because they understand that this is a vital tool to pass on their message and portray their products and services. I find that sunlight changes everything, and we are lucky to have plenty of that all year round. Some photographers prefer flat light, such as that found in cities like London, which tends to be mostly cloudy and overcast. I prefer strong light that’s full of energy. Do we at times take photography for granted? Now more than ever, we live in an era of over-exposure to the medium. However, when a photo has something ‘special’ it still stands out. Are there any particular details you look for in a place or a face? I find beauty in imperfection. When things are too perfect they bore me. I also tend to prefer ‘alternative beauty’ and although the notion of beauty is quite universal, it makes people think or question their ‘safe beliefs’. What makes people so interesting to photograph? For me it’s facial expressions, emotions in the eyes and body language. How does spring exalt your photographic lens? Spring brings everything back to life. Apart from the brighter light around, I tend to be better motivated and look forward to capturing more than I do in winter... I’m not a winter person at all... I find the winter months depressing even though these can have their own beauty. What’s next for Brian Grech? I’m hoping to find more time to endorse some personal photographic projects this year. This tends to be a challenge every year with my busy schedule, but I’ll keep my fingers crossed. aleth / Haven / Port - Heterotopias of Evocation is the title of the selected curatorial project that will represent Malta at the next Biennale di Venezia in 2019. This is the fourth time Malta will participate at ‘La Biennale di Venezia’ following its participation in 2017 with an exhibition entitled, “Homo Melitensis: An incomplete inventory in 19 chapters,” in 1999 by means of a National Pavilion and in 1958 by means of a special exhibition of Maltese Artists. Maleth – at the centre of its theme, the project focuses on the role of the island as cultural centre of the Mediterranean Sea, both in history and in current times. The project invites the audience to reflect on their own lifetime journey of self-discovery, their own search for a personal Haven / Port. Drawing on the tri-fold of history / archaeology, myth / tradition and vision / expectation, the exhibit aims to create within the space of the Malta National Pavilion a topos / locus of artistic conversation for the whole of the Mediterranean Sea. to adopt a self-reflexive and introspective method by looking inward instead of outward, and addressing an issue or concern of a personal nature relating to their own character or that of a loved one or close friend. Students will be encouraged to use Drawing as an introspective tool in the first phase of the project in order to create works that sit in between the visual and the verbal, between art and thinking. Further work inspired by the initial drawings will be developed using studentsâ&#x20AC;&#x2122; media of choice. Bridges of Atlantropa is Workshop Organized by Klitsa Antoniou for First Year Art Students of the Fine Arts Department of the Cyprus University of Technology. Atlantropa was a gigantic engineering and colonization idea devised by the German architect Herman Sorgel in the 1920s. His project proposed to partially drain the Mediterranean forming a European supercontinent. Today, more than ever, the Atlantropa scheme (of forming land bridges in the Mediterranean) seems relevant as it is suddenly fortified by contemporary intensity to remind us of the limits on freedom (migrants and refugees) and the destiny of the inhabitants of this area (surviving amid military, political, economic, social complexities / contrasts, migrations and fluid topographies of rejected, forgotten, unseen and silent memories). Klitsa Antoniouâ&#x20AC;&#x2122;s project Atlantropa-X in the context of the Malta Pavilion at the Venice Biennale, will aim to conceptually and artistically join the two islands of the Mediterranean, Malta and Cyprus, by offering glimpses on the utopian drives and the dystopian fallouts that characterize the Mediterranean area. Following an introduction on Atlantropa scheme and its intentions, First Year Art Students of the Fine Arts Department of the Cyprus University of Technology will be given the hypothesis that they have to build a bridge / land crossing on the sea. They will first conduct a research using drawings and small constructions with various materials. The final project can be of any material but will have two limitations: Length should be 100cm to 200cm, and the construction should float on water. Besides the learning outcomes of sculpture building the aim of the workshop is to guide students to reflect on the limitations of movement imposed on refugees and migrants. lead from discovering the Maltese Pavilion into different discovery journeys in the city where the workshops will take place; from grand museum spaces, to little private museum collection spaces and the private gardens in the city, opening on purpose to welcome the Maltese Pavilion and the young workshop participants. In the same way, the children will be invited to draw or construct images inspired by these stories engaging their imagination and evolving their creative skills using different mediums and processes; colour, paper cutting and folding, model making. Using a pool of researched stories, traditional legends and fairy tales coming from Malta, Cyprus and Italy, the young children will participate in a series of creative storytelling workshops, where the stories will be read out loud in small groups, acted by the children (dress-up and costume play) and performed (using traditional Venetian puppets). A participatory and engaging pedagogic method of involving young children in learning using creative methods as theatreplay and art creation will be applied. The workshops will be based on the Kolb model of experiential learning in museums and galleries, which involves the notions of concrete experience, reflective observation, abstract conceptualisation and active experimentation. The Malta Pavilion is commissioned by Arts Council Malta, under the auspices of Maltaâ&#x20AC;&#x2122;s Ministry of Justice, Culture and Local Government. Ala` Hamameh’s Complex & Extraordinary Artworks. artistry, including; painting, photography, graphic design, installations and video art. However, with the outburst of the revolution, he started to paint on canvas as other media became severely prohibited. ess than a year ago, Chef David Vella took the bold decision to leave his culinary profession and embark on a one way ticket journey across Southeast Asia. His decision raised many eyebrows and concerns among his family and friends. Yet, this was a journey he mulled over many months before and was determined to experience it alone. Over the past months David walked through the busy streets and remote areas of amazing countries including Vietnam, Indonesia and Thailand; breathing in the warm, sticky air tinted with the scent of food spices, car exhaust, and opportunities that each corner of the region offers. VIDA caught up with David in Australia where he has settled down for the time being, to discuss with him his experience with so many cultures, religions, food and above all, the essence of what makes Southeast Asia a must-try destination. How did it all start? It all started when I was young and got a summer job as a waiter to make some pocket money. One day I had the chance to work a shift in the kitchen because we were short of staff. This experience triggered my passion for food and my hunger to learn. How would you define your approach in the kitchen? I like to say itâ&#x20AC;&#x2122;s somehow very Mediterranean influenced but with a French approach since a lot of my training was in classic French cuisine. I say this because even though Iâ&#x20AC;&#x2122;m trained in French cuisine, I prefer to keep my dishes light and fresh. Last year you decided to book a one way ticket to Asia. What encouraged you to take such a bold decision? Various reasons to be honest. The main reason is I believe that you have to stop and take a break once in a while, to try new things, to learn as much as possible about anything in life and find new inspirations from other cultures and ways of thinking. comes to fish. Fish grows differently here. They are much more meaty and robust as they’re always swimming in open oceans with a lot of currents, and they are always on the run from predators. Furthermore, wild ingredients are infinite with such a vast land. Would you recommend such an experience to others? I think in a world like gastronomy, where everything is evolving all time, if one has good knowledge and training in classical cooking, the next step should be to travel and work in as many different cultures as possible. The more new things you know, taste and come across with, the more you can express yourself in your cooking. So yes, I would suggest that everyone should leave his comfort zone and go out to explore other cultures. To what extent is an open mind necessary for such an adventure? Well, an open mind is necessary to do something like this. The cultures one comes across are completely different than what we are used to. One has to keep in mind that you are in a completely different mind set than that at home. Religion is different, beliefs are different and one must always respect that and the land one’s in. You are there to visit, see, teach and learn, not to change what they know or do. What are your plans for the future? What’s next is not clear at this time. I have some commitments here in Australia since I’m a head chef in a restaurant just outside of Sydney which I cannot leave just yet. But, I am certain that my travelling and will to discover new cultures and taste new, unknown flavours from different countries, will continue. METHOD 1. Preheat oven to 350°F. 2. In a medium saucepan, stir together honey, granulated sugar, Irish whiskey and salt. Cook over medium heat for 3-4 minutes, or until sugar is dissolved and mixture comes to a slow boil. 3. Add walnut halves. Stir to coat. Simmer for 5 minutes, stirring, until syrup begins to bubble up and turn a light brown in color. 4. Remove from heat and drain liquid through a strainer. METHOD 1. Position rack in lower third of the oven and preheat to 375°F. Stir the butter and 70g of chocolate chips into a heavy small saucepan over low heat until melted and smooth. Cool until warm. 2. Beat the eggs, sugar, corn syrup, vanilla and salt in a medium bowl until blended. Whisk in the butter mixture. Stir in the walnut pieces and the remaining 110g of chocolate chips. 5. Line a cookie sheet with parchment paper. Place coated walnuts onto parchment paper in a single layer, separating as much as possible. 6. Place in the oven and bake for 8-10 minutes (watch closely so they don't burn). 7. Remove from heat and allow to cool. 8. Once cooled, separate walnuts from each other and use to top a salad, stir into yogurt or as a tasty snack. FRUITLAND Co. Ltd. specialises in the importation of the best Bananas on the islands, as well as exotic and seasonal fruits from all over the world, all year round. Childhood Obesity. A Global Epidemic. to stay obese in are letting our children develop an unhealthy relationship with food. What are the medical consequences? There are a lot of medical conditions which have been linked to obesity in childhood. Among these are: Type 2 Diabetes, Gallstones, Fatty Liver, Menstrual Problems, Skin Conditions and Orthopaedic Problems. Although these problems are normally seen in adulthood, obesity is often the cause when these conditions are present in children. Most of these conditions do improve when the child loses weight, but some of them persist into adulthood. What should we do? As a society, we should aim to address this well-known community problem. By combining an adequate diet and promoting physical activity at school and within the community, we would be most effective in decreasing the rate at which this problem is growing. Parents have a pivotal role and they are obliged to enforce a healthier lifestyle at home. We should teach our children to choose healthier food options. This in turn would eventually lead them to choose healthier options at school and in restaurants. Enrolling our children in sports activities instead of screen time is of utmost importance in our efforts to fight this ever growing epidemic. We are responsible for generations yet to come to not only provide them with a healthier world to live in, but a healthier lifestyle to live! here is something striking in the work of makeup artist Leanne Mallia, which has earned her a reputation as one of Malta’s rising stars in the industry . Leanne is young, talented and with a hunger to succeed. Her magical touch has a unique way to create that ‘wow factor’ that accentuates the beauty in every client who seeks her service. Her aesthetic is one that embraces the bold, yet never at the expense of her clients’ natural features. VIDA recently met up with Leanne Mallia to discuss what triggered her interest in the makeup industry, the challenges the profession offers, recent trends and her plans for the future. What lies behind an ACCA graduate’s shift towards the world of makeup and beauty? I get asked this question a lot and I can understand why. Having an accounting background whilst also fulfilling a career in the world of makeup and beauty, don’t usually go hand in hand. I always wanted to work in an office, and that is the career path I pursued at age 17 when I decided to further my studies by choosing ACCA, whilst also working full-time at a professional service company. On the other hand, makeup was always my passion. I always loved makeup and the way it can enhance and boost confidence. I started juggling my career as a professional accountant whilst also working part-time as a makeup artist. The road wasn’t always easy but I found a sense of satisfaction knowing I was juggling both careers at once. About a year ago, a tragic event happened in my life where I realised life is too short to juggle two careers at once whilst also trying to keep up with my family, social life and friends. It was all getting too much to deal with, so I took the frightening (at the time) decision to pursue my dreams and work as a makeup artist. What is your definition of beauty? In my opinion, beauty comes from the inside. It’s all about having a good character, being compassionate and having a gentle and kind heart. How would you define makeup? Makeup, to me, is the tool that enhances confidence. What do you think are the basics in a makeup bag? I would always suggest having the following in your makeup bag; A good moisturiser to prepare the skin for makeup, full-coverage concealer to conceal dark circles or marks on the face, an eyebrow pencil, mascara and lip balm. Eventually you can start building on the basics to create different makeup looks. Francois Nars once noted, “Makeup is about balance. When the eye makes a statement, the lips should be quiet.” To what extent do you agree? I believe makeup is all about preference. Some people like to make a statement with the eye makeup and keep the lips on a neutral palette, whilst others prefer keeping the eye makeup neutral and having a bold lip colour. Then there are those people, who like myself, love to experiment with glitter and bold colours. What are the current trends? Do you have any ‘go-to’ signature looks that work every time or do you prefer to experiment to see what’s best? Currently glossy looks are back - after years of matte liquid lipstick, the tides are turning and it’s time for lip gloss to shine again! I love experimenting with different makeup looks, new products on the market and new trends. However, there is no denying that I do have my ‘go-to’ looks which never fail me when I’m working on a client and there isn’t much time to get ready. They are classic looks which are always in style and always include winged liner and a bold lip colour. What’s next on your agenda? I’m currently working on a number of exciting things, but my main focus is to finalise all works on my salon which I will be using to provide makeup services to my clients, personal makeup courses (in small groups) and individual makeup lessons.